There are so many different types of bullet journal collections out there; there are trackers, different monthly layouts, and all sorts of lists. 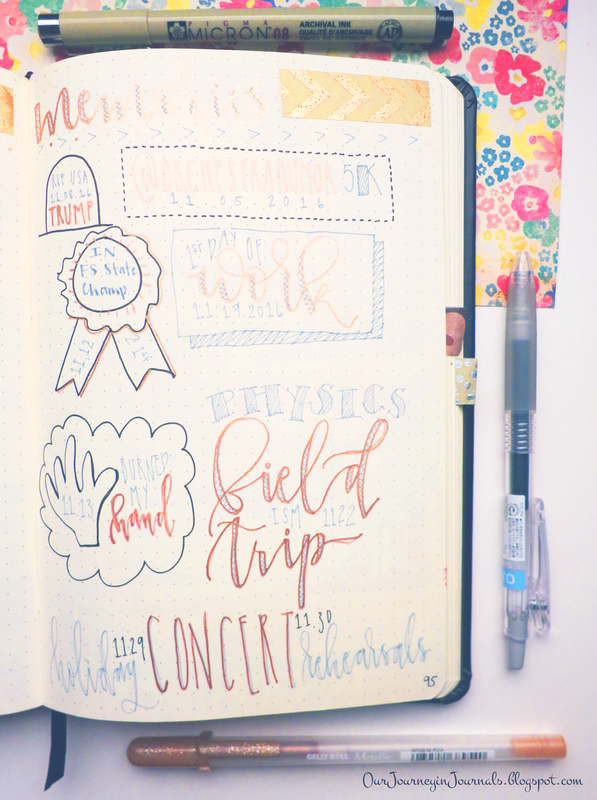 However, one of my very favorite collections in my bujo is the monthly memories spread. 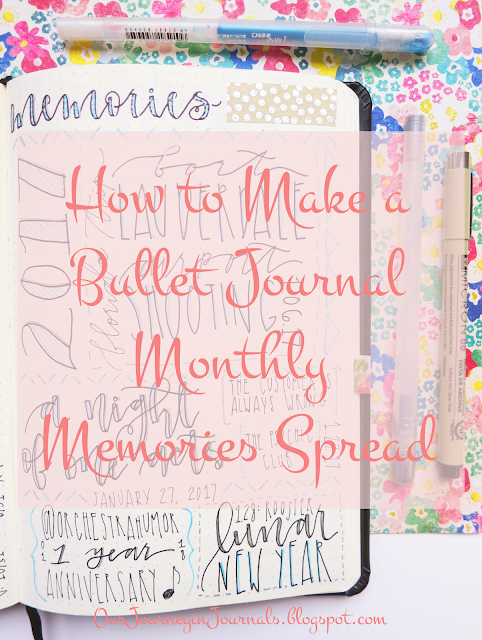 I first heard about it from Boho Berry, who learned about it from Passion Themed Life, and I find that it's a great way to incorporate your bullet journal into memory-keeping. If you want to learn how to make this type of spread, then read on! Essentially, a monthly memories spread is a one page layout you make for every month that contains big, notable things that happened in that month via little doodles for each event. It's fun practice for hand-lettering/calligraphy (or drawing), and along with record-keeping, and it also adds decoration to your bullet journal pages. I myself make the header of the blank spread at the beginning of the month while I am setting up for the month (with the monthly calendar layout first, then the habit tracker, then the memories spread). I find that this is the easiest way to place the page itself. You can just remember them in your head, but then you risk forgetting something. You can add notes in your monthly layout or daily spreads. For the latter, you can highlight the things you want to include so that it's easy to find them when flipping through your bujo. You can stick a Post-it note onto the blank page to keep a running list of things as they come up. This is what I personally do. After the month is over (or at the end of the month), I create the actual spread. Because this is a very free and artistic type of layout, there is not necessarily a specific way that you HAVE to set it up. However, I do have several tips and very general guidelines to get the most out of your spread. If you want to see all of my past monthly memories spreads, then you can find them by looking through my bullet journal setups. First of all, the actual entry things in my spreads are done with calligraphy. I sum up the event in a couple of words or with a short title, and then I hand-letter those words. Sometimes, there's even a crappy-looking doodle to accompany the calligraphy. If you want to learn some basic calligraphy, then I suggest starting out with faux calligraphy. I also sometimes incorporate some doodles into my spreads, and if you are actually good at drawing (unlike me), then you may find that having drawing things out instead of hand-lettering them will work better for you. Secondly, you probably should have the specific dates that the different events occurred on. This is when the aforementioned techniques come in handy so that you actually have a record of these dates. I usually just put the number (e.g. "1.03" for January 3rd) somewhere by the lettering. Third of all, don't be afraid to mix up the sizes of each event. In fact, it's a good idea to do so! In my bullet journal, the more important an event was, the bigger I make its section in the memories spread. This adds some visual interest to the layout and organizes it better. With a glance, you can easily see the month's cream of the crop events. Lastly, just have fun with it! This is a very free-form sort of layout, so you can let your artistic abilities shine and your creative juices flow. 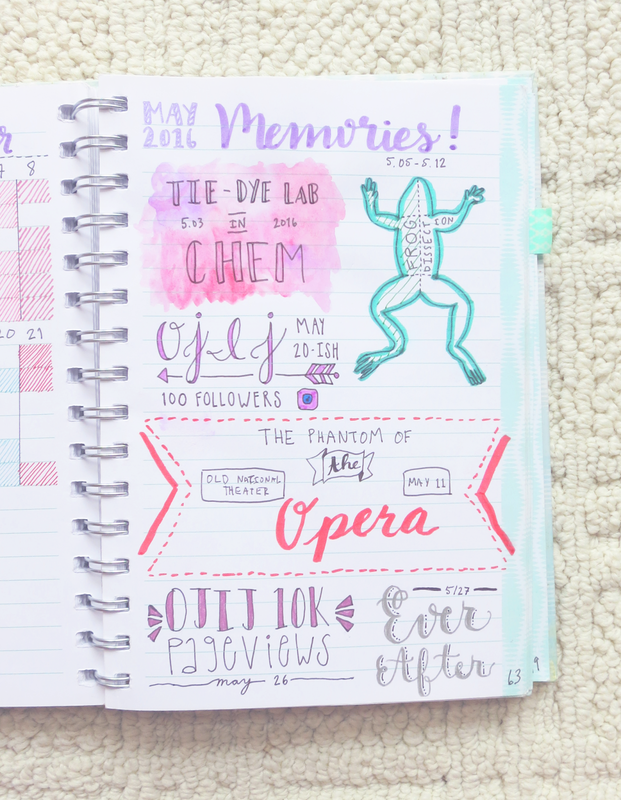 One beauty of the bullet journal is the ability to incorporate memory-keeping, and this is just one of the more enjoyable (but still organized) ways to do it. 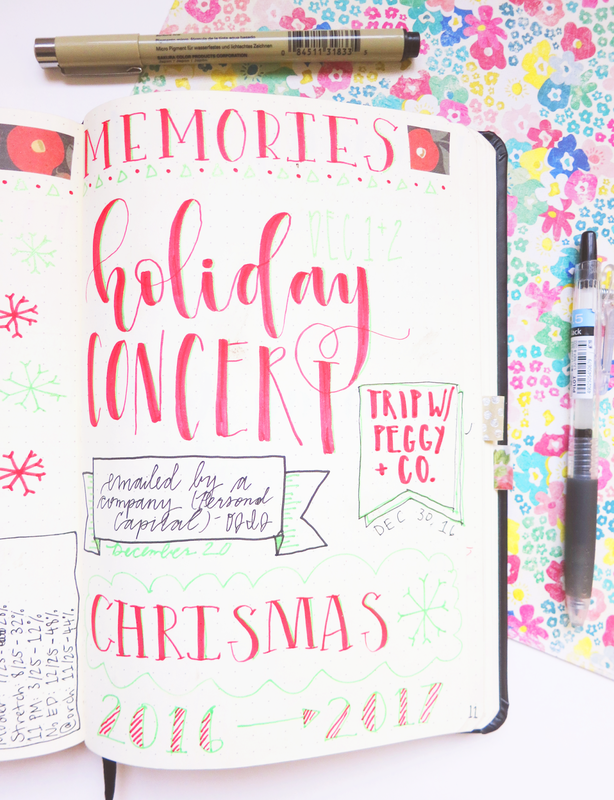 You can use washi tape, fun pens, stickers, stamps, or whatever else you want to decorate the spread. It's all completely up to you. 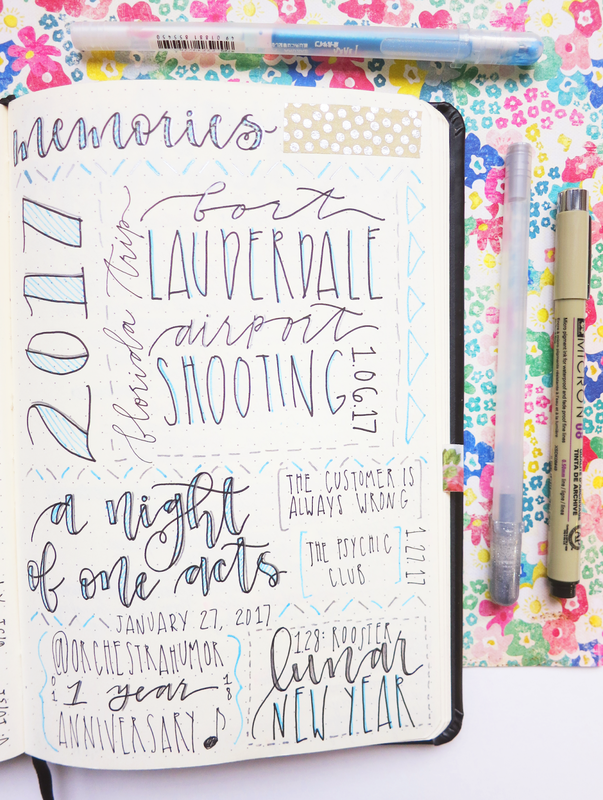 So that's it - that is how to make a monthly memories spread in your bujo! It's one of my favorite bullet journal spreads to make and one of my favorites to look back on in the future. What sort of things would you include in your own memories spread for this month? Let me know by leaving a comment!